I hope, by God’s grace, that this poem will imbue you with hope. Thank God for the gift of life. Thank Him that you have seen today and by His mercy will see tomorrow. What doesn’t work today may work tomorrow. What doesn’t come today may come tomorrow. We can always have hope because we have a tomorrow to look forward to. And today is the tomorrow you hoped for yesterday. So, while all the answers to your prayers may not manifest today, as they say in the popular venacular, something will drop today as evidence of God’s faithfulness to you. Hold on to that one and more will come tomorrow. THANK GOD FOR TOMORROW. BECAUSE WE HAVE TOMORROW, WE SHALL NOT DESPAIR. Wow! No one I know has captured anticipation with such resplendence. Someday soon you will be my Guest at The Urban Lounge at my Center. THE URBAN LOUNGE! Word Party Every Friday - Script it! Say it! Sing it! Thank you, Sir Osita! You're always kind. A great day to you! Thanks again Aunty for the beautiful job you've taken up to do especially in these times when encouragement has grown really lean. Thank you too, Dani! You are blessed! Glory to God, and remain blessed, Praise! Yes, as long as we're alive, there is hope. May God's blessings locate you, Nnenna, in Jesus' name. To God be the glory! You're blessed, Ebere! What a Blessing you have been to me, dear one, since I have begun to follow your writings. This is lovely! Glory be to God! And what an encouragement you have been to me, my dear Dorothy! Stay richly bkessed of the Lord now and always. The Bible said "do not worry about tomorrow but let tomorrow worry about itself... This is a promise of hope. why will I worry when I know that a great future awaits me? The secret is just for one to be patient, believe in God and the best will come. Well said, Micah! God bless you so so much in Jesus' name. Well composed and motivating. The general feeling that some desire will be fulfilled, that is hope. Our tomorrow is what we are struggling for. In spite of the struggles and difficulties surrounding our present, we should never give up. Let's hope that all will turn out well. God bless you, ma, for this wonderful poem. 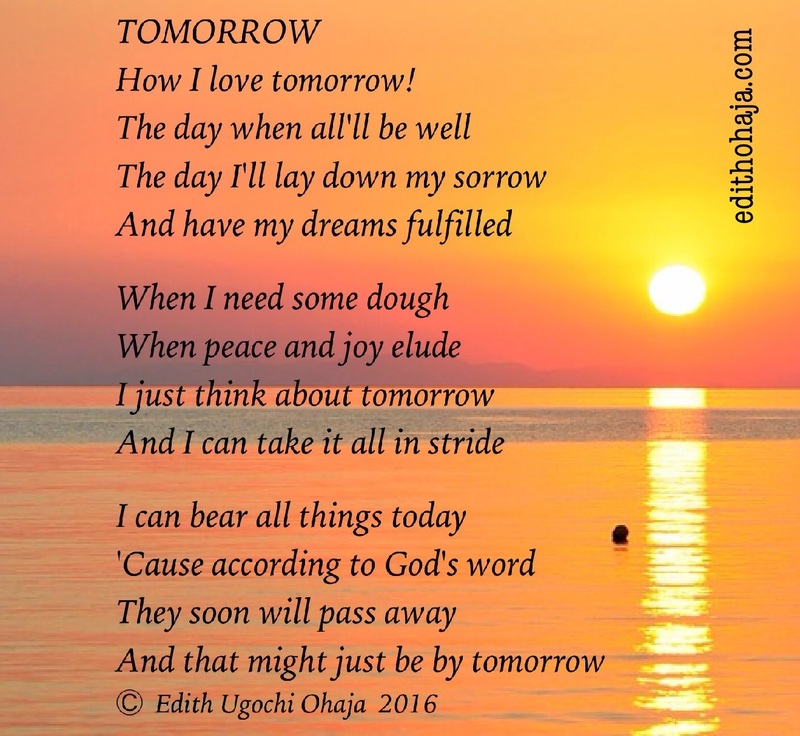 This poem reminded me of a song, "my tomorrow must be greater than today". Weeping may endure for the night but joy comes in the morning, says the Bible. That morning is our tomorrow. This poem is an encouraging piece admonishing us All to persevere despite whatever we might be facing. There's always a sunshine after the storm. Thanks ma, for your words of encouragement.... i really hope for a great tomorrow. When there is life, there is hope.we should not be in a hurry to give up or run into conclusions. So let's keep praying that our tomorrow will be better especially in Nigeria in Jesus Name. Amen. Wooow... This is quite motivating because many atimes we are faced with horrible situations which tempt us to give up. Thank u ma for this heart lifting poem.